Last month I was shipped a box of items to try from Influenster in the J’adore Vox Box. I tried out each of the items, but some take longer time to really test. 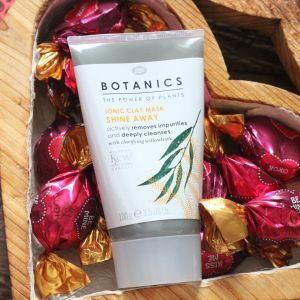 One of the items that I’ve been using consistently has been the Shine Away Boots Botanics Ionic Clay Mask. Now, its no secret that I’m pretty picky about what goes on my face. I’ve talked at length about my battle with cleansers and over-the-counter makeup. 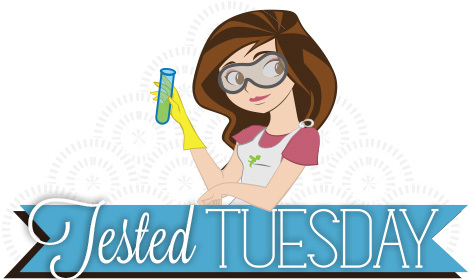 I’ve since turned to DIY Moisturizer, DIY Mineral Foundation, DIY Pore Cleansing masks and more. So, I’ll be honest and say that I really didn’t expect this product to wow me. However, I do often use mud masks (I buy the powdered clay and mix the masks myself) and the idea of having one ready-made was pretty appealing. So, I had a look. Part of the reason why I love making my own clay masks is that there aren’t any funky preservatives, perfumes or colorants in them. I’m not particularly sensitive to any of these things, but why use them if they aren’t needed? The clay powder that I use contains only clay/minerals. Yeah. Its just dirt. So the first thing I did was take a look at the ingredients of the Shine Away mask. I’m no expert, but the only item on this list that concerned me was the Sodium hydroxymethylglycinate. The clay and arctium lappa are naturally occurring and sort of the key ingredients. The glycerin and butylene glycol are stabilizers/agents to help keep the mix together and are widely used organic chemicals/compounds. So that leaves the Sodium hydroxymethylglycinate. Sodium hydroxymethylglycinate, based on my research and prior knowledge is a naturally derived but not necessarily naturally occurring salt that acts as a preservative. Out of the 5 ingredients in the mask, this is one only controversial one. Some say that it is a skin and eye irritant, and breaks down into formaldehyde. Others say its an excellent safe alternative to other, worse products. Both agree its a great preservative and antimicrobial. Well, I like to live on the edge. So I decided that with only 5 ingredients, 4 being on my good list, this mask deserved a try. My results were good, if not earth shattering. The mask came out of the tube smoothly, felt good on my face, and didn’t irritate my skin (even though I got distracted and left it on almost double the time I was supposed to). The only reason I’m not raving about it is, well, it felt like pretty much every other mud mask I’ve ever used. My skin was softer after, if a little moisture-hungry. I didn’t really notice any major shine reduction or acne prevention/pore cleansing. The spa-like effect was nice though, and I’ve used the mask a few times since then. It is nice to have one premade! Overall I like the mask. Would I buy it again? Maybe if the others I own run out. It certainly didn’t convince me to throw away all of my other powder masks. But I like it, and I’ll likely use it until it is gone.